"A little bump and grind." Every gamer knows Ys. Not everyone knows what it is -- one of the grand-daddies of JRPGs -- but they’ve heard of its legend. 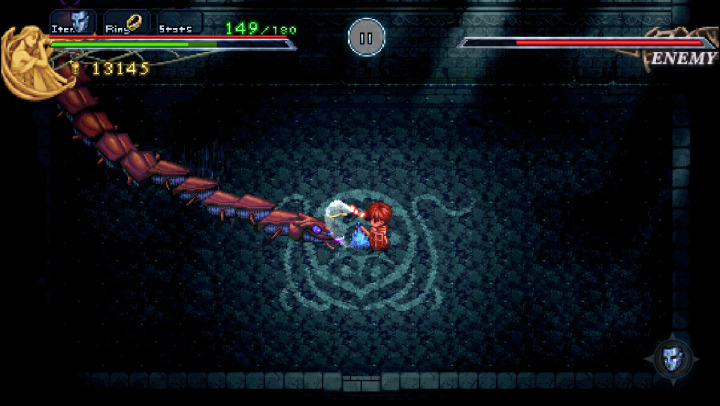 I’m not an Ys fanboy, or even an RPG enthusiast in general, but I’ve managed to try my hand at no less than a half dozen iterations on as many platforms. And that’s Ys’ legacy: it’s like the adventure version of Raiden, having made an astonishing number of stops over its long history, and it’s still going. This first game, this Ys Chronicles 1, while gorgeously scored (as is the norm for the canon), with its simple story charmingly told, is rather slight, especially by today’s standards. It’s no wonder it is commonly packaged along with Ys II so as to present something more substantial. And though its top down swashbuckling may bring to mind The Legend of Zelda, this and other early Ys' quests were marked by their ‘bump’ approach to battles. No attack button is required; you need only bash into foes to do damage, taking care not to get hit from the side or back or head on. The small story of young swordsman Adol guided by fortune teller Sara to track down the Books of Ys towards putting down a growing evil, and its unique, 'button-less' battle system presented a unique opportunity: here was a console game which could conceivably be better suited to touch screen phones than on the consoles (or archaic PCs) from which it originated. Credit to DotEmu for fully capitalizing, and knocking it out of the park. Ys Chronicles 1 is, predictably, a port of the first half of the PC installment Ys I & II Chronicles+, first released in 2013 and still available on Steam. As such, it features the same wonderful cut scenes, the same excellent orchestral remixes of Yuzo Koshiro’s (yes, that guy, of Streets of Rage fame) original tracks. 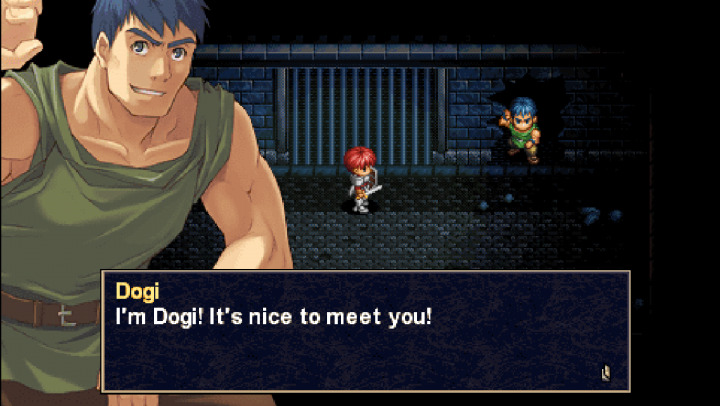 But the touch screen actually improves the Ys experience, allowing you to comfortably drag our hero Adol about, from town to dungeon, from NPC engagement to and through enemy positions. Ys offers a handful of side quests involving your deciding to be helpful. The overworld strings together only a few towns, broken up by a dark mine and a straightforward dungeon, but the game culminates in a surprisingly long and daunting tower challenge, fraught with bosses, making the experience oddly back-heavy. Enemies get stronger at a reasonable rate, only slightly outpacing your own progression, limiting the experience grind to palatable levels. The real challenge here are the bosses. They move fast and will kill you just as quickly if your level isn’t where it should be. I suppose I was grateful for that -- if you’re not ready, you’ll find out in a hurry and it’s back to the plains to do some focused bumping. From the giant bat comprised of a dark swarm of smaller bats, to the confounding projectiles tossed about by the mantis, to the impossibility of Dark Fact himself, these are the classic (and difficult!) encounters you’ve heard about. The only drawbacks of note are down to the limitations of the source material: again, the scope of the adventure is small, the bosses can be overwhelming, and the challenge of Darm Tower takes the game somewhat jarringly from 0 to 100. But then, this game is originally from 1987, and Ys Chronicles 1 is what we thought it was. And with this iteration, we have a pretty looking and sounding update for modern tastes whose size and controls are a perfect match for the iOS platform. If you’d heard about the landmark Turbografx-CD version, or the quaint and even older Master System game and felt as though you missed out, this is where you get on board. This just might be the ideal retelling of the classic -- if limited -- RPG that we all know. If you enjoyed this Ys Chronicles 1 review, you're encouraged to discuss it with the author and with other members of the site's community. If you don't already have an HonestGamers account, you can sign up for one in a snap. Thank you for reading! Learn to screencap scrub. Third. Out of two reviews, even. I still have that Darm Tower music stuck in my head. IIRC, they make you climb it again in Ys IV. I can stay silent no longer: I appreciate that tag line on multiple levels. Anyway, thanks for the screens. Obviously, they're in now. this is god review, in bright future I watch for more reviews from you. dotemu do good job with ys origin too. I very interested to try play with phone controller that uses the touch. if you are retro gamer plz play ys on old system called Turbogarfx, it is CD with more greater music. you might like maybe?